Halloween is here and i can’t hide my excitement!Just like a child-i adore everything about our small family rituals that we do on holidays.Candies,horror movies and scary costumes became so much more fun since i become a mom!Not to mention my crazy passion for the pumpkin and every recipe that contains pumpkin!ADORBS! 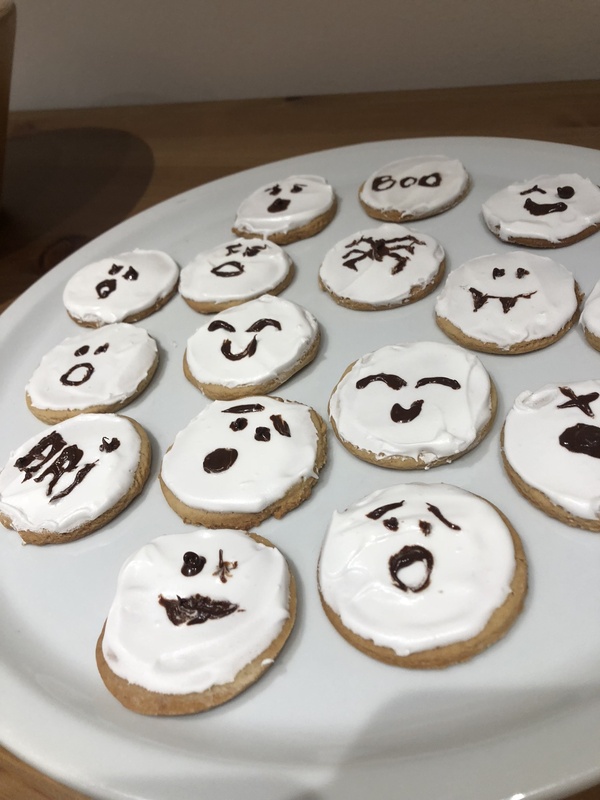 I am sooo excited to write to you about these (quite easy) Halloween cookies we made yesterday!The house smelled like vanilla and lemon and there was this celebration atmosphere in the air!My son was running and screaming all day from pure happiness-and that has boosted our Halloween mood to the fullest!We feel like kids-that’s for sure! Every year-I am getting inspired by different things.As my son grows-i am noticing how extremely happy these small things are making him-and that gives me a feeling of absolute accomplishment.So-i wanna do some more-and make more of these cute little surprises! 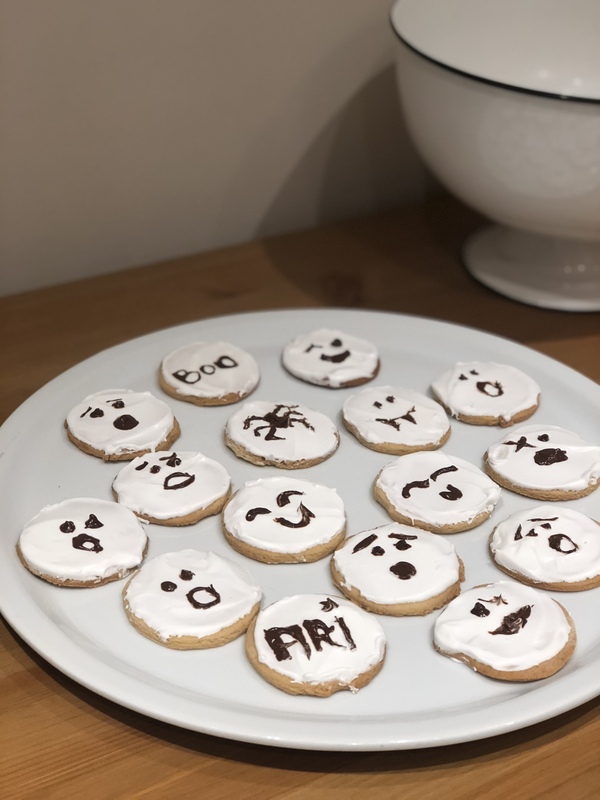 This year i decided to make Ghost Halloween butter cookies!These are basically plain vanilla butter cookies with royal icing and a bit of painting skills at the end! In a big bowl mix butter and sugar until fluffy.Add egg and continue mixing.Add vanilla.Slowly add flower and ay attention on your dough not to be stiff.When you finish mixing it with your hands-put in kitchen paper and leave it in the fridge for 1 hour at least. 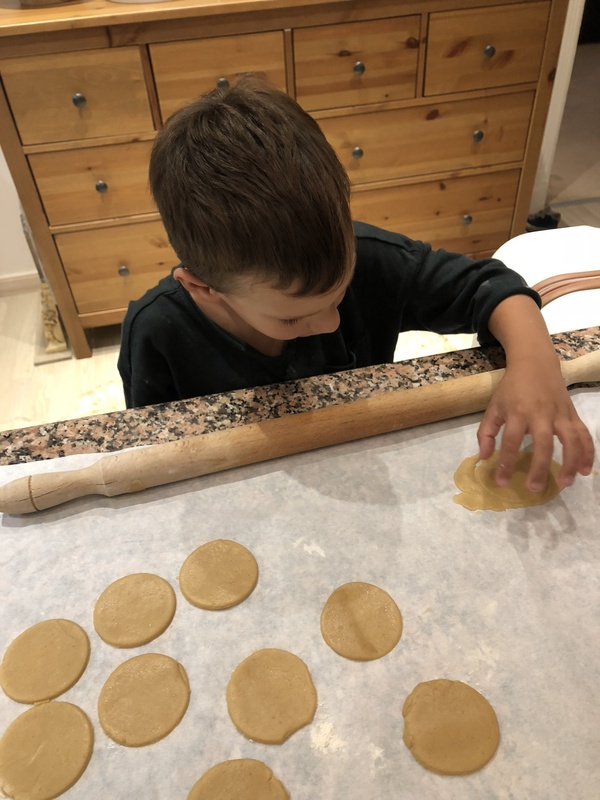 Take it out from the fridge and mold it at the surface where you have put a bit of flower previously-sop it doesn’t stick.With your rolling pin make a thin dough-aprox.2-5cm thin.Take your cookie cutter and cut the cookies. 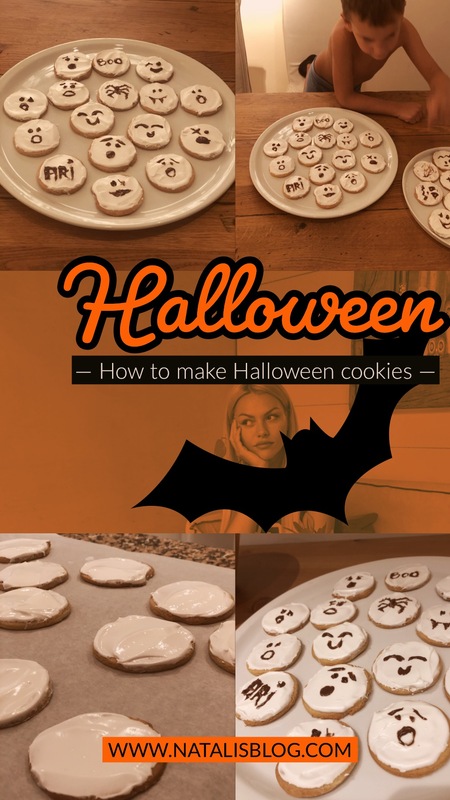 Make small round cookies and bake them on 180 c in preheated oven.When they start to become golden-take them out. 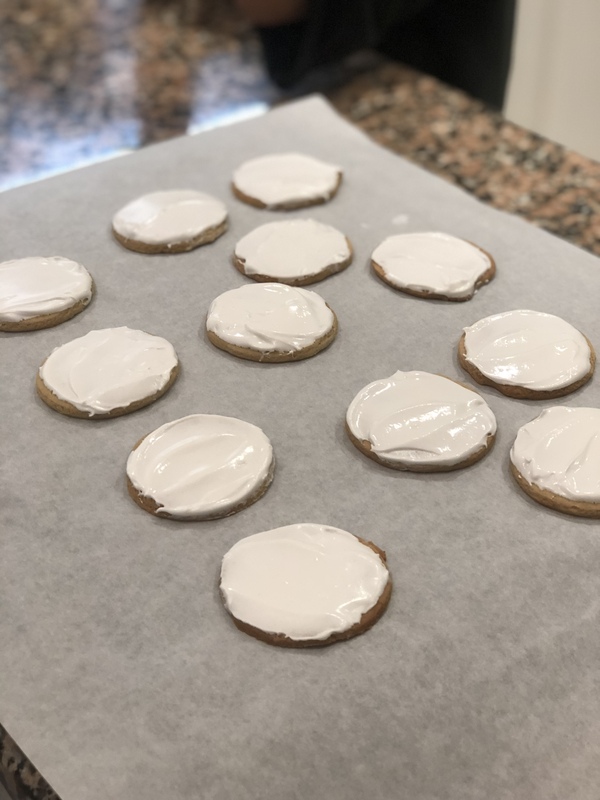 Start making royal icing.Mix well 2 egg whites with the dust sugar.Mix aprox.6 minutes until very stiff and fluffy.Add lemon and mix some more.Apply immediately on cooled cookies.Melt your dark chocolate and paint small ghost faces! 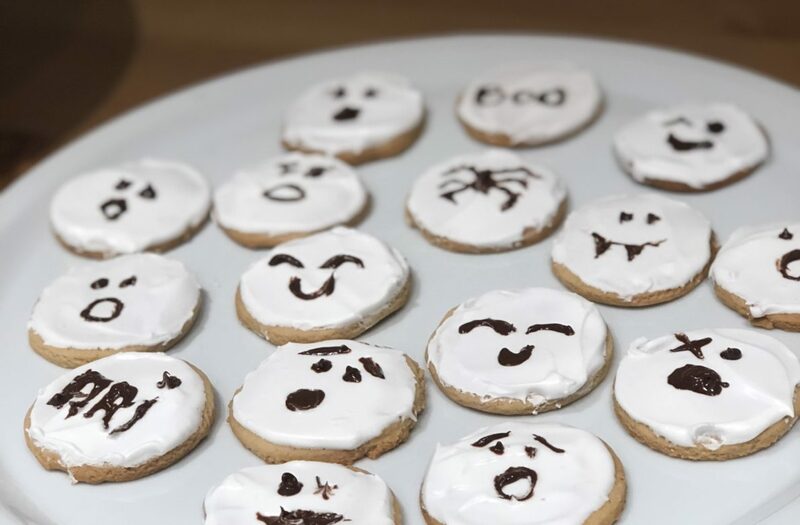 There you go!They are lovely-they are fun and most of all-kids a re going crazy over them!If you could just see they funny proud faces when Halloween cookies are ready-It’s priceless!Loooove theeeem!Happy HALLOWEEN guys!